Rodtrip - Happy Birthday Rodtrip ! 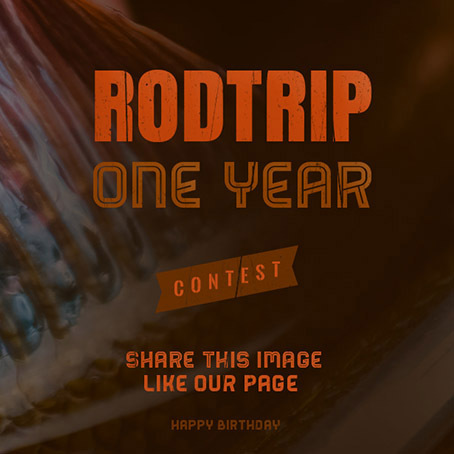 That’s it, Rodtrip is now 1 year ! I wanted to start with a little story toexplain you how this project started. For the occasion we also organized a little contest, all details are below. I started this project 3 years ago, first it was just an idea, then I started looking for a name. May be one of the hardest task when you start a new project, but the name “Rodtrip” came up quite fastly. This new word was expressing exactly tthe meaning I wanted to give to Rodtrip, a place where to talk about fishing also accompanied by the adventures and travels that surround this passion. We spent a lot of time in the car to go fishing, we went in Spain, Slovenia, Austria, Norway, France etc. that’s why the word roadtrip came to my mind and it didn’t took too long to know that the idea was just there… Rod and trip, it did make sense, our trips were always on the road, with our rods in the car ! The same day I reserved the domain rodtrip.com and started to work on the logo. This logo is inspired from a picture of a friend that I took one late evening on a wonderful belgian river. After that I spent a lot of time working on the concept and the design, this part was a bit easier than the next step, the code ! I can say that it was the hardest task, as I was doing everything by my own and at this time I was not really experimented in web development. But at the end, after two years and a bunch of work, the website finally launched and this was really great because having ideas is one thing, but making them happen is another. I can’t say that everything is perfect, but it’s there and since one year we have another challenge, making it live ! And for that, fortunately, I have been quickly joined by other great people ! First by my fishing bro, Jérémy and followed by other incredible fly fishers. We are now a solid team of 10 people, having a lot of fun during our shared experiences ! Long live to rodtrip and happy birthday ! To participate simply go on Facebook, like our page and share the banner of the contest on your wall ! The winner will be announced on Sunday, the 27th of October. Happy Birthday to You, my friends! I like not FB…..That’s a “garnement “tool’s …. Thank you Alain :))))) I saw your post on Google+, thx !